bl.uk > Online Gallery Home	> Online exhibitions	> King George III Topographical Collection	> Waltham Abbey Essex 18-1-b. North west view of the remains of Waltham Abbey in Essex. It was once one of the most prosperous and influential abbeys in England. An Anglo Saxon collegiate community was established here in 1060 by Harold, and after his death at the Battle of Hastings, traditions say his body was buried in a spot within the church he patronised. It was re-founded by Henry II in 1177 as an abbey of Augustinian Canons and and the Abbot was in 1184 given the title of 'mitre' by the Pope, a sign of its importance. It was the last of religious houses to be dissolved, finally falling in 1540. As can be seen, the nave of the 12th century abbey church remains and is now the nave of the parish church. 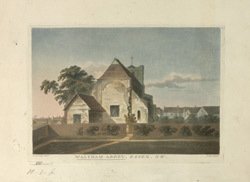 This print shows where the rest of the abbey church would have come, before it was demolished. The parish church's west tower was built in 1556 using material from the abbey.